For the most part, there is little to no need for strong chemicals or cleaning solutions when cleaning appliances in your kitchen. You can accomplish a great deal with elbow grease and hot soapy water using a dish detergent with grease-cutting ingredients. You can also clean any small appliance with vinegar (either diluted or full-strength) or a baking soda paste. Do not use harsh abrasives or steel wool. Use non-scratch sponges or synthetic scrubbers for cleaning appliances. Always unplug the appliance first before cleaning! If any parts of the appliance you are disassembling for cleaning come in contact with electrical components, make sure the non-electrical part is completely dry. If the carafe becomes stained, place 1 cup ice, 1 tsp. lemon juice, 3-4 tsp. salt, and a tiny amount of warm (not hot) water in the carafe. Allow to sit until the ice has melted; swish the solution around, then wash with hot soapy water. 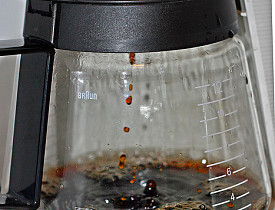 To clean the outside of the coffee maker, use a solution of vinegar and water, then rinse well with warm water. To clean the inside of your drip coffee maker choose one of the following two methods: 1) Run a solution of ½ cup vinegar to 4 cups warm water through the brewing cycle, then rinse three or four times by running plain tap water through the brewing cycle. 2) Mix ¼ cup baking soda with one cup water to run through the brewing cycle, then rinse as you would with the vinegar solution. Keeping your toaster clean will help you to prevent fires and avoid burned crumbs that tend to set off your smoke detector. Unplug and cool the toaster. Remove or unlock the bottom tray. Shake the toaster briskly over a trash can to knock out most of the crumbs. You can use a bottle or pastry brush to clean out any remaining crumbs. Wash the tray with warm soapy water and dry thoroughly. Wipe off the outside of the toaster with a mild vinegar solution and dry well. Spray a vinegar solution to the outside of the base. Scrub with an old toothbrush and wipe clean with a paper towel or clean cloth. As an alternative to taking the pitcher portion of the blender apart and washing in hot soapy water, you can also put the hot, soapy water in the pitcher and run it on high for 15 or 20 seconds, then rinse. The best way to keep electric can openers clean is to consistently wipe after every use so that food residue doesn't get caked onto the cutting wheel. Every few months, remove the cutting wheel and wash in hot, soapy water. All other parts can be scrubbed with a baking soda paste and an old toothbrush, then wiped off with a clean, warm, wet cloth and dried. To clean the inside of the tank and the base, use ¼ cup of vinegar to 2 cups water. Let the solution sit for a few minutes, then rinse. If there is heavy mineral build-up, use a stronger solution of vinegar and allow the humidifier to sit for 8-10 hours. Afterwards, rinse well. You can use the vinegar solution to clean all parts of the humidifier. It eliminates the need to use bleach or corrosive cleaners. Place a microwave-safe cup of water in the microwave and turn on high for 2-3 minutes. Leave the door closed another few minutes, then wipe the interior down with a clean, dry cloth. The steam does a great job of loosening particles of food and sanitizing the inside. Use warm, soapy water and a clean cloth to clean the outside of the microwave. Make sure to clean under any removable knobs. SAFETY TIP: To prevent superheating, insert a toothpick or wooden skewer in water before microwaving it. Using these simple principles you can keep your small appliances clean and healthful. Regularly cleaning appliances extends their life, which saves you money.